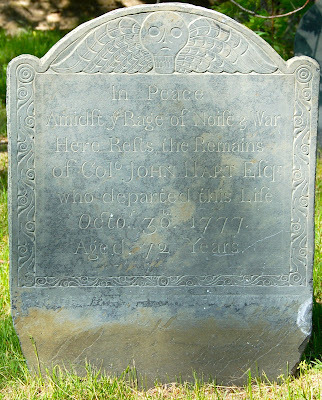 In Portsmouth, New Hampshire, I found three gravestones with the same, unusual inscription. All date from the Revolutionary War era and look like Lamson shop stones, though I can't be sure. They all start the same way: "In Peace Amidst ye Rage of Noise & War Here Rests the Remains of . 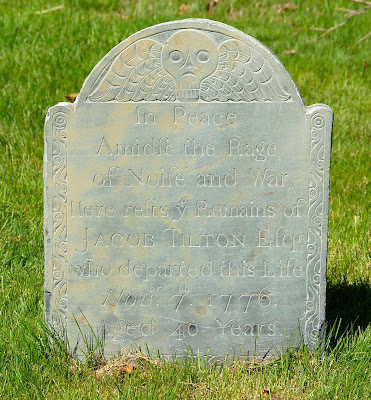 . ."
I'm very interested in gravestones that recognize public events. The Jason Russell stone is a good example of a stone dedicated to a single person that nonetheless has a lot to say about current events. These three stones aren't quite as overt — no barbarous murders or bloody troops, but they acknowledge the war. And noise and war are heard no more. That's from a 19th-century edition, so I don't know how early the verse is. More careful searching could probably trace the original publication.